Winner: Justin Price by unanimous decision. Winner: Brad Wire at 1:17 in round 1 by tap out due to armbar. Winner: Nate Tigney at 2:08 in round 2 by verbal submission due to strikes. Winner: Shaun Kealo at 1:22 in round 1 by tap out due to head scissor choke. Winner: Dustin Diehl at the conclusion of round 2 – opponent unable to continue due to arm injury. Winner: Darryl Humphrey at 54 seconds in round 1 by verbal submission due to strikes. Winner: Cheap nfl Jerseys Brad “Kool-Aid” Hinderer at 2:20 in round 1 by TKO – referee stoppage due to strikes. Winner: Drew LaFord by split decision. Winner: Eric “The Reject” Burress by unanimous decision. Winner: Greg Sizemore at 39 seconds in round 1 by TKO – referee stoppage due to strikes. Winner: Kyle Stevens at 1:09 in round 1 by tap out due to guillotine choke. Winner: Tyler Pitock at 1:31 in round 3 by TKO – referee stoppage due to strikes. Winner: Jesse Bazzi at 1:07 in round 1 by tap out and due to guillotine choke. Winner: Muhammad Abdullah at 41 seconds in round 2 by knock out by flying knee. Winner: Rob Taylor at 1:09 in round 3 by TKO – referee stoppage due to strikes. Winner: Katie “Deuce Deuce” Dihle by unanimous decision. Winner: Kyle Lingg at 1:07 in round 2 by tap out due to rear naked choke. Katie Dihle vs Tasha Moore & Tyler Pitock vs Joshua Wilkinson. Knockout of the Night was awarded to Muhammad Abdullah. Submission of the Night was awarded to Shaun Kealo. Tagged Brad Hinderer, Brad Wire, Darryl Humphrey, Drew LaFord, Dustin Diehl, Eric Burress, Greg Sizemore, Jeff Pitock, Jesse Bazzi, Justin Price, Katie Dihle, Kyle Lingg, Kyle Stevens, Mike Pedenelli, Muhammad Abdullah, Nate Tigney, Norbert Pasztor, Pete Trevino Jr., Rob Taylor, Shaun Kealo, Tyler Pitock. Bookmark the permalink. The flying knee KO by Muhammad Abdullah was incredible! The womens fight was def FOTN! 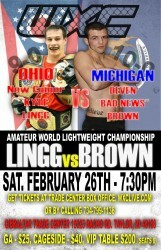 Great fight between Brown and Lingg as well! Overall it was another awesome night of fights put on by WXC! Definitely have to check out the music video highlighting the event. Here’s a link! We only post what the promoter sends us, or what we see. We weren’t at this show. But if what you are saying is true…I can definitely understand your concern.